At a town hall meeting at Woodburn High School in mid-January, Senator Ron Wyden contrasted his expectations of a Trump presidency with what he called the “Oregon way.” As Wyden put it, “In our state, we’re all about bringing people together. We’re about being inclusive and showing respect for one another.” But is that really the Oregon way? Wyden’s homey multicultural vision of an inclusive state skates over a long and sordid history of racism and exclusion in Oregon. With a legacy including the exclusion of Black people from the state in the mid-nineteenth century, the prominence of the KKK in the 1920s and of neo-Nazi skinheads in the 1980s and ’90s, the 1887 massacre of Chinese gold miners in Hells Canyon, and the internment of Japanese Americans during World War II, Oregon has arguably not been so welcoming to Blacks, Asians, and Latinos; Catholics and Jews; and immigrants. And yet the 2014 referendum on whether undocumented immigrants should be eligible for driver’s licenses shows Oregonians are divided over immigration. In that election, 66 percent of voters rejected granting driver’s licenses to undocumented immigrants, while in the same election 56 percent of them voted for legalizing pot. This is where Oregon’s famed libertarianism butts up against its xenophobia. Voters were willing to challenge the federal government on marijuana, but they were unwilling to provide even the most basic kind of identification—required for opening a bank account or renting an apartment—to undocumented immigrants. The idea of sanctuary has moral weight, but what it means to lawyers, politicians, and the general public is not exactly clear. Sanctuary originally developed as a medieval legal concept in England, where churches could provide temporary sanctuary for people accused of crimes. By the seventeenth century, as the state expanded its authority, legal sanctuary ended, but the idea of sanctuary as a moral norm persisted in the culture. The sanctuary movement has been building in Oregon since 1987, when the state adopted a statute meant to disentangle Oregon from immigration enforcement by prohibiting the use of state resources for this purpose. In the 1980s, churches in Oregon and across the country declared themselves sanctuaries for Central Americans fleeing violence in their countries. Although the federal government charged and convicted some of the leaders of that sanctuary movement with harboring and transporting “illegal aliens,” their moral vision won the hearts and minds of the general public, leading to Oregon’s sanctuary statute. Unlike sanctuary churches, sanctuary cities and schools do not say they will violate the law. Rather, they draw clear lines between the responsibilities of federal immigration officers and the responsibilities of local and state police. Most sanctuary jurisdictions simply prevent local police and other officials from inquiring about a person’s immigration status. Local sanctuary declarations cannot stop immigration officers from conducting raids or making arrests, but they can make it harder for Immigration and Customs Enforcement (ICE) to deport millions of immigrants. The new sanctuary movement accelerated with Trump’s election in November. In the immediate aftermath of the presidential election, students and faculty at over 180 colleges gathered more than 150,000 signatures on petitions in favor of declaring their campuses as sanctuaries. Portland State University and Reed College were among the very first in the nation to explicitly declare themselves sanctuary campuses, with the University of Oregon, Oregon State University, Portland Community College, and a host of other colleges following suit. Not every school embraced the sanctuary term, but there was a growing consensus that in Oregon we would not cooperate with federal immigration authorities unless ordered to do so by a court. Many schools also cited another federal law, the Family Educational Rights and Privacy Act (FERPA), which prevents them from sharing information about students without their consent, as a legal argument for why they could not cooperate with the federal government. On January 27, Trump issued his first executive order related to immigration, banning all travel from seven Muslim-majority countries and vastly expanding the definition of who he considers a “criminal alien” to encompass virtually all the undocumented. The country was thrown into chaos. Here in Oregon, hundreds of people spontaneously protested at Portland International Airport, carrying signs welcoming refugees and decrying the ban on Muslims. One woman went to the airport dressed as the Statue of Liberty to welcome the first family of Iraqi refugees to arrive after federal court Judge James Robart in Seattle issued a nationwide temporary restraining order on Trump’s executive order. Oregon’s libertarian streak provides us with a powerful tool with which to fight for immigrant-inclusive policies at the state and local level against the power of an oppressive Trump administration. Governor Kate Brown issued her own executive order on February 2, expanding the scope of Oregon’s 1987 sanctuary statute. Under Brown’s order, all state agencies are prevented from using “moneys, equipment, or personnel for the purpose of detecting or apprehending persons whose only violation of law is that they are persons of foreign citizenship present in the United States in violation of federal immigration laws.” This has been the strongest statement to date of “disentanglement” or noncooperation with federal immigration authorities. Oregon, it seemed, was a robust sanctuary state. However, it quickly became clear that in spite of the Oregon statute (ORS 181A.820) and sanctuary pronouncements from politicians, immigrants were still vulnerable to deportation simply by showing up at a courthouse. ICE confirmed that they arrested five immigrants at or near Multnomah County courthouses in January. Since November, even before Trump took office, ICE was trolling the courthouses and questioning Latino-looking people. There have even been cases of undercover ICE agents stalking Latino people in the courthouse and following them outside of the building. Although Trump has claimed that sanctuary cities are hotbeds of crime, an analysis by political scientist Tom Wong at the University of California, San Diego shows that sanctuary cities are much safer than their non-sanctuary counterparts. ICE arrests at sensitive locations like courthouses, schools, and hospitals make our communities less safe. Facing pressure from defense attorneys and immigrant advocates, Multnomah County District Attorney Rod Underhill issued a statement that seems to disentangle the courts from immigration enforcement: “The Multnomah County District Attorney’s Office does not notify or alert immigration officials or agencies regarding individuals (witnesses, victims, or defendants) with whom we come into contact,” Underhill wrote. However, once a person is arrested and processed, there are multiple ways that ICE officials can learn about their presence, including perusing public dockets, referring to FBI databases in which fingerprints of all arrestees are recorded, or by simply calling a deputy sheriff and inquiring, which appears to have happened in late December in Multnomah County. The Oregon statute that prohibits the use of law enforcement resources for immigration cases contains a subsection that explicitly carves out an exemption for “exchanging information” with ICE to “verify the immigration status of a person if the person is arrested for any criminal offense.” What this means is that once a person has been arrested as a suspect in a crime, the ban on exchanging information may be null and void. At the very least, the clause suggests that there are circumstances in which state officers are allowed to communicate with ICE. What’s more, the immigrant in question does not have to be convicted and they don’t have to be accused of a felony. “Any criminal offense,” even a low-level misdemeanor, will do. Governor Brown’s executive order expands the so-called “sanctuary” statute to all state agencies, but the order says it is not meant to violate state or federal laws. In particular, the order refers to two 1996 federal statutes (8 USC 1373 and 1644) that explicitly prohibit states from preventing their employees from sharing information with federal immigration agencies. There is an obvious contradiction between these federal statutes and Oregon’s law, but in twenty years the federal government has never tried to enforce its statutes. Under Trump, such a collision between federal and state law seems all but inevitable. Juliet Stumpf, a professor of immigration law at Lewis & Clark Law School, argued that, in spite of the federal statutes, federal law “doesn’t compel Oregon to allow employees to use public resources—money, equipment, or personnel— to provide information to ICE.” Stumpf continued, “If it did, it could run headlong into the Tenth Amendment’s prohibition on federal commandeering of state resources.” The very meaning of state sovereignty is at issue in these arcane legal questions. In the past few years, federal courts have consistently argued that counties that cooperate in the detention of immigrants at the request of ICE are in violation of Fourteenth Amendment due process protections and Fourth Amendment protections against unreasonable searches and seizures. Oregon used to honor ICE “detainer” requests to hold people in detention after they were eligible for release until a federal judge held Clackamas County liable in 2014. As one legal analysis put it, “Nearly every court to address the federal government’s immigration detainer practices have [sic] found them to be illegal—either violating the immigration statute, or worse, violating the US Constitution.” According to this view, the Oregon statute and Governor Brown’s executive order are not violations of the law, but rather an attempt to get Oregon on the right side of the US Constitution. State sovereignty and the US Constitution are not at odds, even though the state may be in conflict with federal overreach. What has become clear in the past few months is that sanctuary provides no protection to immigrants once they are caught up in the criminal justice system. An immigrant may live in a sanctuary state with multiple sanctuary cities and sanctuary schools and colleges, but city, county, and state authorities are helpless to prevent deportation once someone enters the system. Biased policing places immigrants of color in Oregon at even greater risk. A study of records in Multnomah County by the Portland Tribune found egregious over-policing—especially for minor violations—of Latino communities, which make up the bulk of the undocumented population. The Tribune found that in Oregon Latinos were eight times as likely as whites to be charged with driving without a license. Even controlling for the estimated number of undocumented residents who cannot acquire a license, legal resident and citizen Latinos are twice as likely as whites to be stopped for this offense. Once immigrants, documented or undocumented, get caught up in the criminal justice system, they are vulnerable to ICE deportation. Whether ICE agents are in direct communication with law enforcement officers or simply hanging around the courts, questioning Latino-looking people, or scanning the dockets for Latino-sounding names, broken-windows policing of the sort described by the Portland Tribune leads to deportations. Sanctuary is a meaningless designation unless tied to meaningful criminal justice reform. The current practice of broken-windows policing leads to the deportation of scores of low-level immigrant offenders. While we have next to no control over federal immigration policy or Trump’s erratic and badly planned executive orders, we can influence local police priorities. The only way to provide meaningful sanctuary in Oregon is by changing how we police our communities so that we focus on violent criminals and stop arresting people for jaywalking or spitting in public. 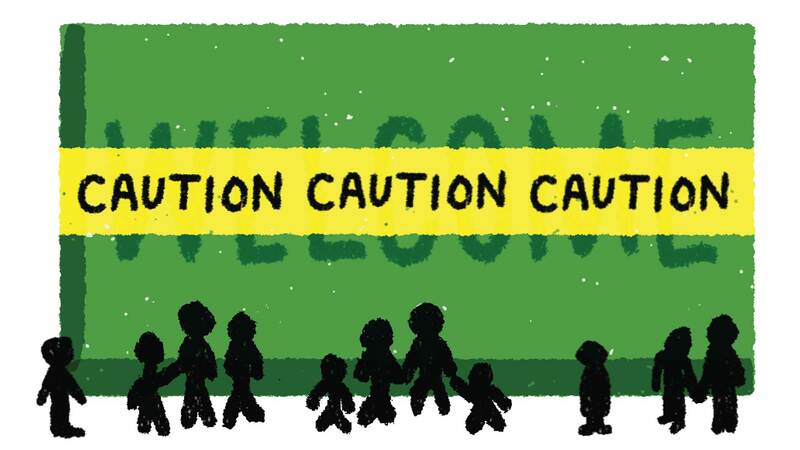 If we do this, not only will we help make Oregon welcoming for immigrants, but we will also help to end the national crisis of mass incarceration. Elliott Young is a professor of history and director of ethnic studies at Lewis & Clark College. He has published two books on borderlands history, Catarino Garzas Revolution on the Texas-Mexico Border and Continental Crossroads, both by Duke University Press. His most recent book is Alien Nation: Chinese Migration in the Americas from the Coolie Era through World War II (University of North Carolina Press, 2014).